Home baristas rejoice! De’Longhi has created a small and affordable espresso machine for those who enjoy making their espresso and cappuccinos in the comfort of their own home. 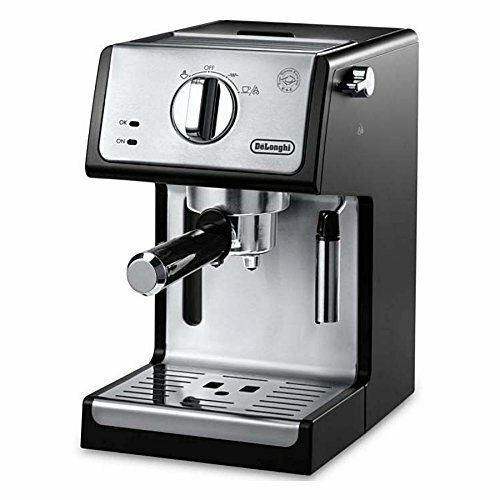 It can be tricky searching for an espresso machine that allows you to have control over much of the brewing and steaming process. Lucky for us, as the name implies, the manual espresso machine is unique in that you can adjust the water pressure and steam pressure to your desired setting which makes this semi-automatic coffee machine perfect for those who want to take control over their morning cup of Joe. 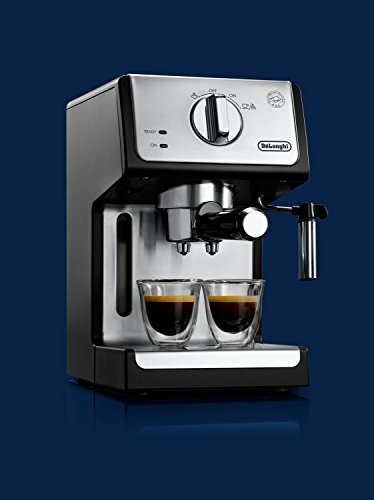 Currently a top competitor within the under $200 market, the De’Longhi reputation for quality and consistency continues with this model. With its black and steel design, 15” bar professional steam wand, and wallet-friendly price, it is easy to see why so many have fallen in love with the machine. The ECP3420 has a simple design of one large dial with four options to turn to – on, espresso, steam wand, and off. At 10 x 7 x 12 inches, the stainless steal design is easy to clean and matches well with any kitchen décor. This is easy to fit on any countertop and a great addition to your appliance collection. Next, we have the portafilter split which splits in two, so you can make one or two espresso shots at once. Below the portafilter sits the drip tray, which you can take out if you need to accommodate larger cups of coffee (for those sluggish Monday mornings!). And next to this is the steam wand with the 15 bar pump. This part can get dirty easily, so make sure to thoroughly take apart the wand after every use and clean well with soap and water. Additional features include a slim removable water tank that is super light. You should be able to make quite a few espressos with the 37-ounce tank and at least 3 larger drinks using the steam wand. When replacing it into the machine, you can feel the tank click back into place as you put it back into its original position. 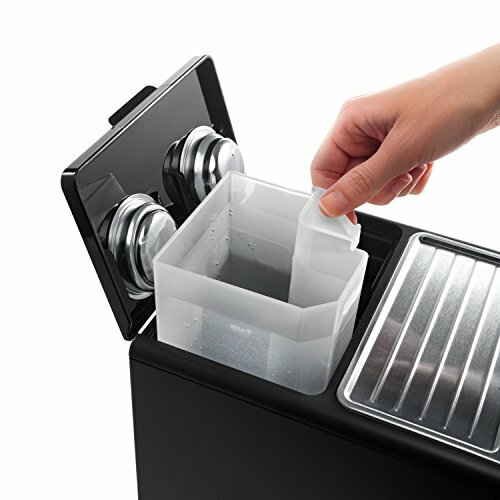 There is ample room in the storage compartment to hold the water tank, extra portafilter inserts, and any espresso pods you have (more on that later). For the true coffee nerd, there are two separate thermostats to control your water pressure and steam pressure separately, allowing you to adjust your personal preferences as you see fit. Waking up to begin your morning routine is a breeze with this machine and its pre-heating system. Turn the knob to the “on” position and give it about 5 minutes to get to pressure. While I am waiting for that to heat up, I can grind my beans and prepare my milk to be frothed. Once your machine is ready to go, the brew light will turn green and you can start to pull your shot! The secret to achieve a good crema on your coffee is to use fresh coffee and an espresso grind. When tamping the coffee, be sure not to compact the grinds too tightly so water can flow through. Be sure not to overfill the coffee filter. De’Longhi recommends using one measuring scoop per cup. This particular model is able to use ESE (Easy Serve Espresso) beans, which are like small round tea bags but full of espresso grinds instead. They are a great way to cut down on prep time and clean up. These pods can be purchased directly through the De’longhi website or you can find them at larger supermarkets and online retailers. The steam wand on this model works very well to create textured foam for drinks. It can only steam a small amount of milk at a time and I would recommend purchasing a frothing pitcher if you are serious about achieving the perfect creamy latte. The steam wand is easy to manipulate and is long enough to get a nice froth. As a barista, I was looking for an option that allowed me to get that feeling of crafting my own professional drink at home. With this model, I can happily say that I enjoyed that feeling. It gives enough power to the user to enable anyone to customize his or her own drink. If you prefer a no-brainer in the morning (I know sometimes I do), this machine offers a lot in terms of fast quality options—though you may have to skip the milk if aren’t feeling up to the task. To be honest, clean up with this machine is a breeze. For daily cleaning, you can quickly wipe down the outside of the machine and drip tray, as well as rinse out the head. It is strongly recommended that users perform regular deep cleaning as well. Pop out the plastic water tank, portafilter, and drip tray. Use hot soap and water to scrub until clean. 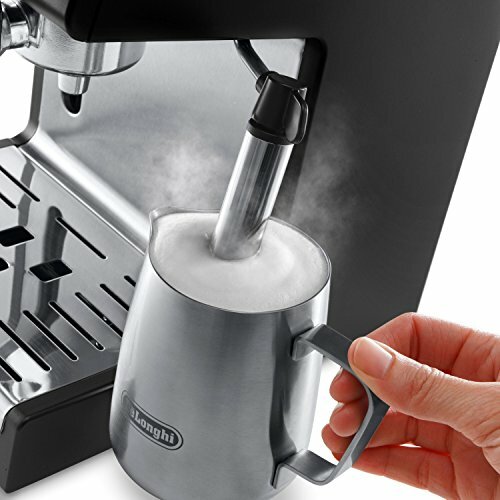 To descale the pump, their website recommends using De’longhi Descaling solution in the tank once every 200 coffees. Let the machine run in the on position for 5 minutes and then empty the descaler solution by alternating between the espresso and steam wand functions. Arguably the biggest thing going for the De’Longhi is its favorable price point. For the emerging coffee enthusiast looking to advance their skills or the barista on a budget (those coffee tips only go so far) this machine combines quality with budget. Google ranks the De’Longhi #5 for best espresso machines under $200 and several other sources have ranked the device among the top rated espresso machines under $200. Keep an eye out during the holidays for extra sales (ahem, black Friday anyone?). Amazon had great deals on this machine during its online black Friday sales and Prime day as well. 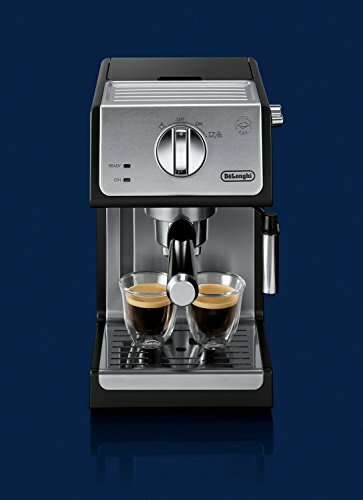 Overall, I would say the De’Longhi ECP3420—Espresso and Cappuccino Maker—is a great choice! It has a clean, modern exterior that makes cleaning super easy, while possessing a unique ability to tailor water and steam temperature preferences from buyer to buyer. 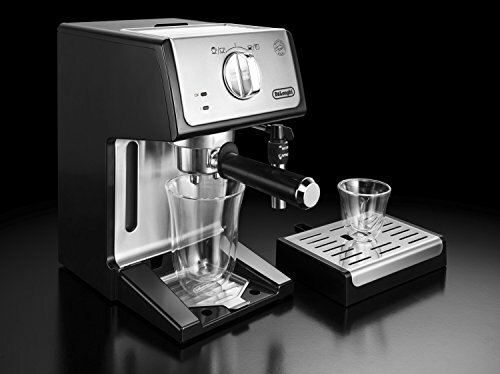 De’Longhi has long had a solid reputation in the maker space for delivering quality products and satisfying customers. It looks like they have done it again! The biggest draw for me would be the affordability and adaptability. In addition to the machine being barista friendly, it allows for the use of espresso pods for those on the go. With a consistent record and a low price point, it is an easy win for anyone looking to add an espresso maker to their set of coffee tools.